Cartier originally introduced their first Mystery (or Mysterious) clock, which features hands the appear to be floating, all the way back in 1912. This year, at SIHH, they launched a new collection of Mystery wristwatches: the Rotonde de Cartier Mystery watch and the Rotonde de Cartier Double Tourbillon Mystery watch. The main function of the original complication has been refined for use in the 9981 MC and 9454 MC movements, which respectively power the Mystery and Mystery tourbillon watches. What is the Mystery behind the floating hands of the Cartier Mystery clocks and watches? 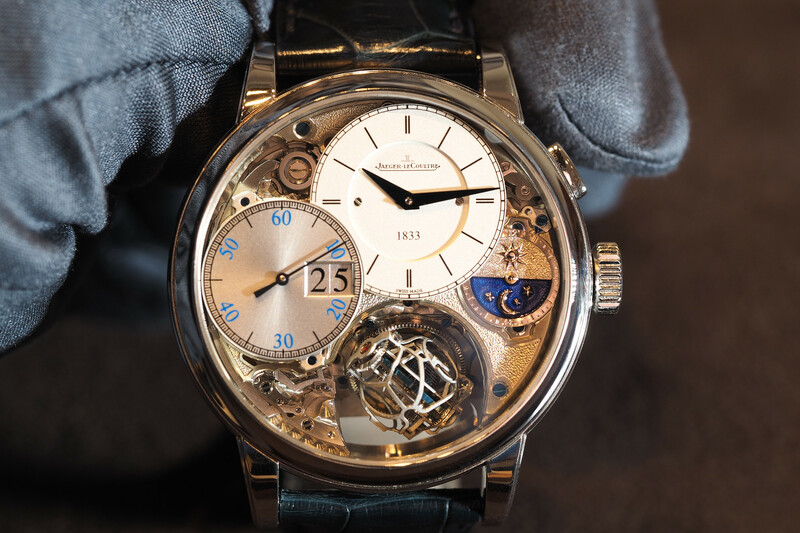 The Mystery is invisible sapphire discs that connected to the hands (or tourbillon), the discs are connected to the gears, power is transferred through the gears to the discs, which in turn rotate the hands (or tourbillon). 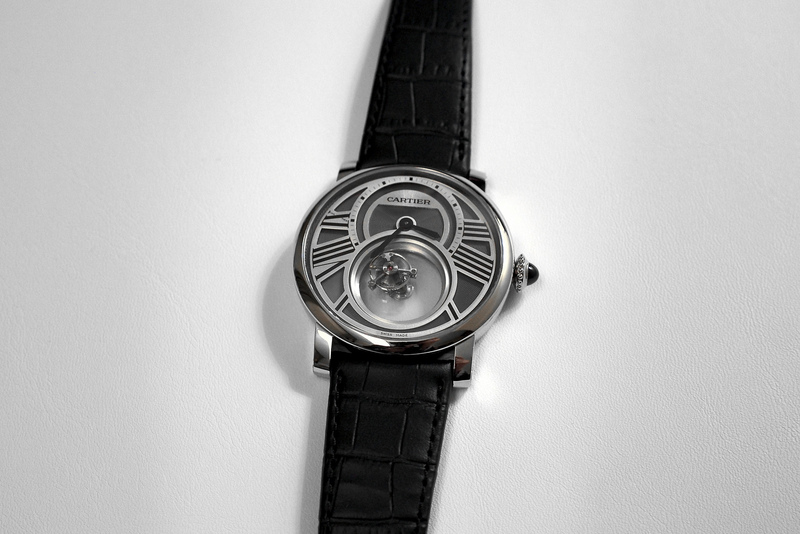 The Rotonde de Cartier Mystery, comes in either a 18K white gold (ref. W1556224) or 18K pink gold case (ref. 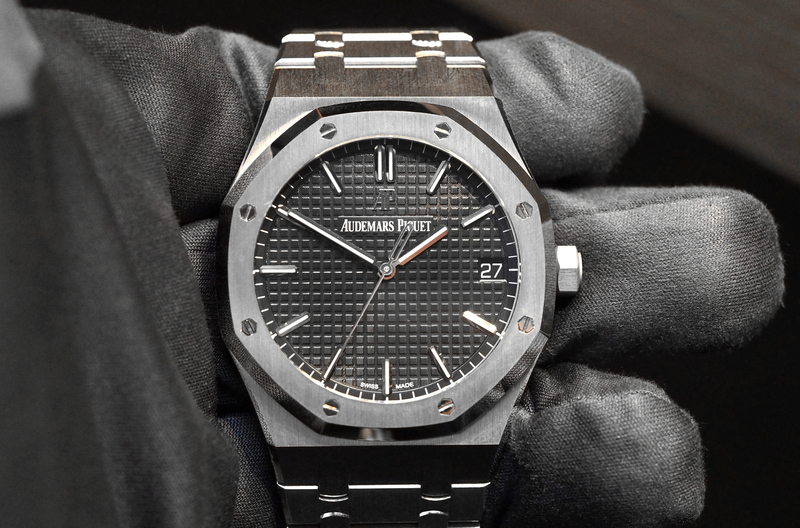 W1556223), the diameter of the case is 42 mm, with a thickness of 11.6 mm. The crown is set with a signature blue cabochon. The dial features a white galvanized guilloché dial, silvered openwork grid with sunray effect, and transferred Roman numeral. Sapphire crystal protecting dial and case back. Sword shaped hands in rhodium coated steel. Brown alligator strap with double adjustable folding buckle in 18K pink gold for pink gold version and black alligator strap with double adjustable folding buckle in 18K white gold for white gold version. The movement, caliber 9981 MC, is manually wound with 158 parts including 27 jewels, with a frequency of 21,800 vph and power reserve of 48-hours. Water-resistant to 30 meters. The Rotonde de Cartier Double Tourbillon Mystery watch comes in a polished 45 mm by 12.45 mm platinum case (ref. W1556210). The crown is platinum and features a circular-grained finish and is set with a blue sapphire cabochon. A sapphire crystal protects the dial which is slate grey with a galvanized guilloché finish, silvered openwork grid with sunray effect and transferred black Roman numerals. Hands are sword shaped in blued steel. A sapphire crystal case back allows a view into the movement, caliber 9454 MC, which is manually wound with 242 parts including 25 jewels, with a frequency of 21,600 vph and a power reserve of 52-hours. The tourbillon cage, which houses the balance wheel, balance spring, escapement wheel and escapement pallets — rotates inside the cage once every 60-seconds, and like most tourbillons, acts as the seconds indication. 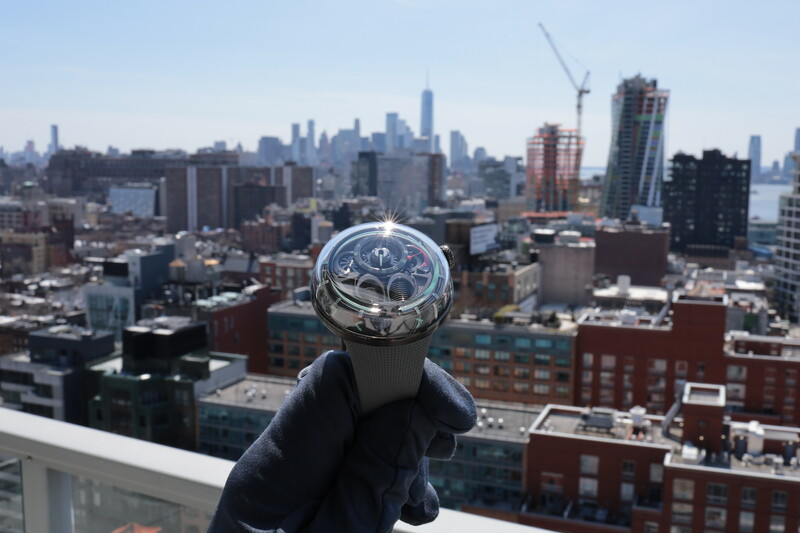 Additionally, what makes the watch a “double tourbillon”, is that the tourbillon itself rotates on the invisible (mysterious) sapphire disc, once every 5-minutes. Mystery clocks have been part of Cartier for over a century, and with the introduction of the impressive new Mystery collection, they will be around for many more years to come. Retail on the pink gold Rotonde Mystery watch is $52,500 and $56,000 for the white gold version (white gold uses a very rare metal called palladium, hence the higher price). The Double Tourbillon Mystery price is by request only.